Next morning we got up and headed towards Konya, which is more than 500 km away. On our way to Konya, Tanja is telling me about operation Barbarossa she pulled out in the shortest period of time, just to surprise me. She exchanged countless e-mails with my cousin Ivana, so the operation could run smoothly and without any suspicions; turning the London office of the Iranian embassy upside down to get her visa as soon as possible; chaos she caused when she showed them her picture without her head covered…I’m glad I have such a determined girlfriend. More details about this is in her blog called: 1000 days of summer – the woman’s perspective. 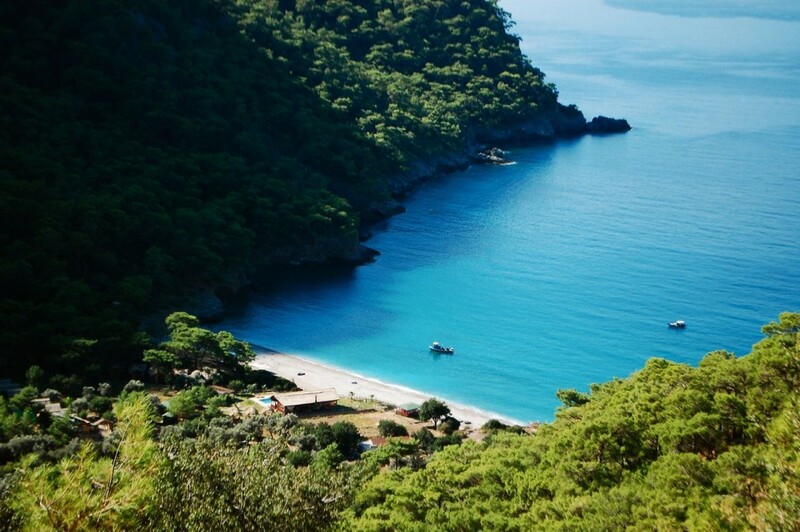 We were climbing for 45 minutes up from the canyon in which Kabak Valley is situated, to get to the local minibus, which will take us to the first big town, from where we can hitchhike. On our way up, loaded with our backpacks, my sheep, instruments (Tanja brought with herself our cavaquinho – little Portuguese version of ukulele, all that just to make the perfect first impression, visually and auditive, while playing “Over the rainbow”), while the sun was burning, we literally left our souls there. But, we did it! Although, I’m not sure about our mountain-climbing career. Soon after, we were strumming in the crowded, heated bus, and finally got to a town called Fethiye. We are moving on by hitchhiking, although the first hour was more like standing in one place, because nobody would pull over. Since the night was falling, and we were moving too slowly, we decided to stay in Antalya. We really wanted to avoid big cities full of tourists…but well, here we are. We sent only one CS request and kept our fingers crossed that it will work out well (but carefully, we need them in good shape for hitchhiking tomorrow). And just when we took out the guitars and started playing to make some money to rent a room, we got a text message that we have a couch! Sometimes it pays off to be confident and play just with one card. And it was the good one, the card I mean, because in a tourist destination like this one, we rarely saw a tourist, because we were too busy talking to our host. That’s one more thing to add to the meaning of life list – avoiding tourists in touristic cities. When I think about it, that should be in my CV, something like: special skills. 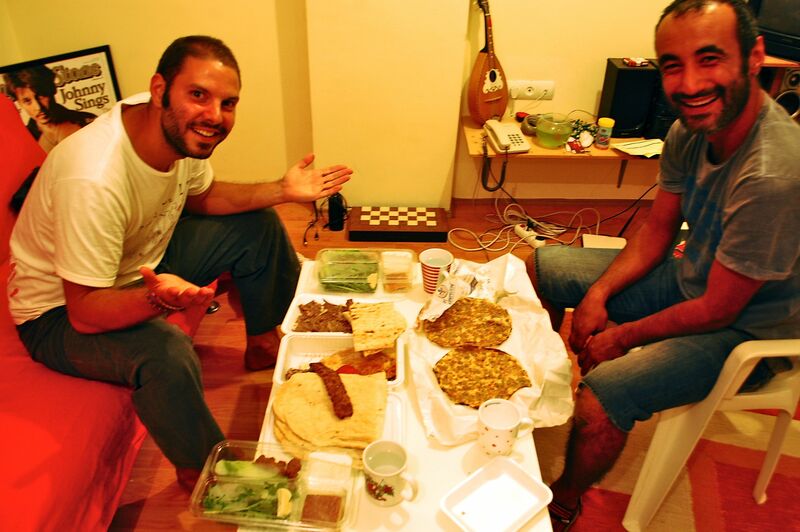 About our Turkish host…after he gave us food and drink, he gave us his room, while he was couchsurfing. As you can imagine, we felt really bad about it. 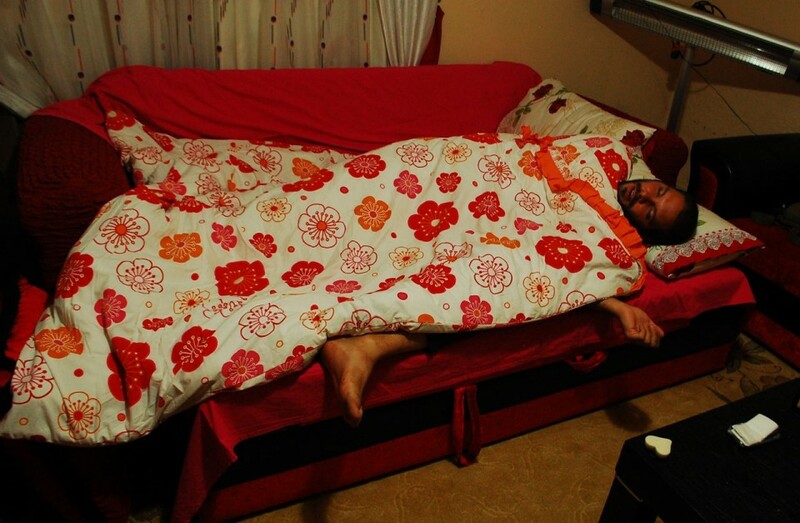 It turns out that Turkish guy and I shared 5-6 of the same couchsurfers, during our CS careers. Nice coincidence. Next day we moved on. We’re so good at hitchhiking that we are ignoring trucks and riding only with cars. 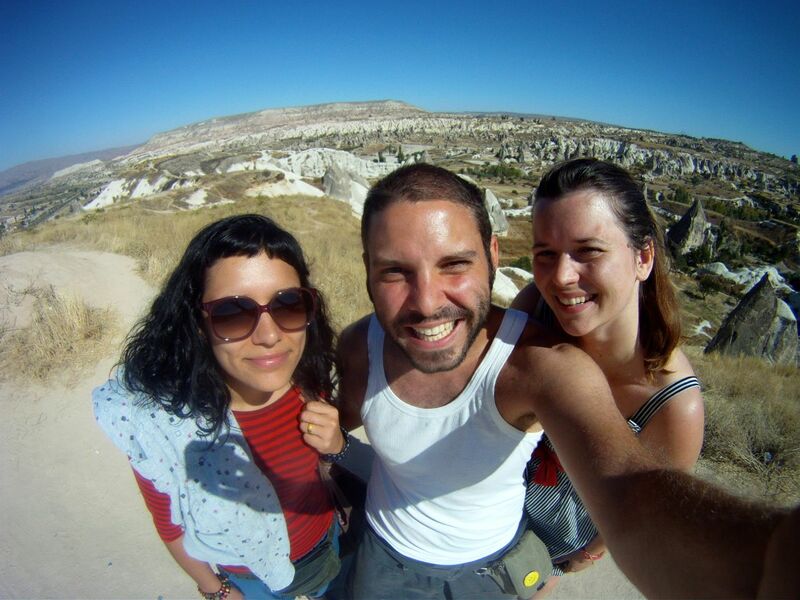 And, instead of Konya, after 8 hours and 550 kilometers we end up in the middle of Cappadocia – the spectacular valley of Goreme. We are surrounded by loads of rattling geological structures and shapes, clueless of what they are – and it just leaves us breathless. As we get out of the car, we see an older man waving at us from a beautiful, six-stored stone house cavern. These houses date back from 4th century (we do know something), so no wonder that our (future) host is making sounds like Yabba Dabba Doo. He is offering us to stay in his cavern, and we are explaining to him that we don’t have any money. He just waves his head like ‘never mind’, so we decide to occupy one floor. We barely took off our backpacks, and he already served us with melon, Raki and some sliced snacks. It is obvious that Turkish hospitality goes all the way to the stone age. After we finished our dinner, we went for a walk under the stars. 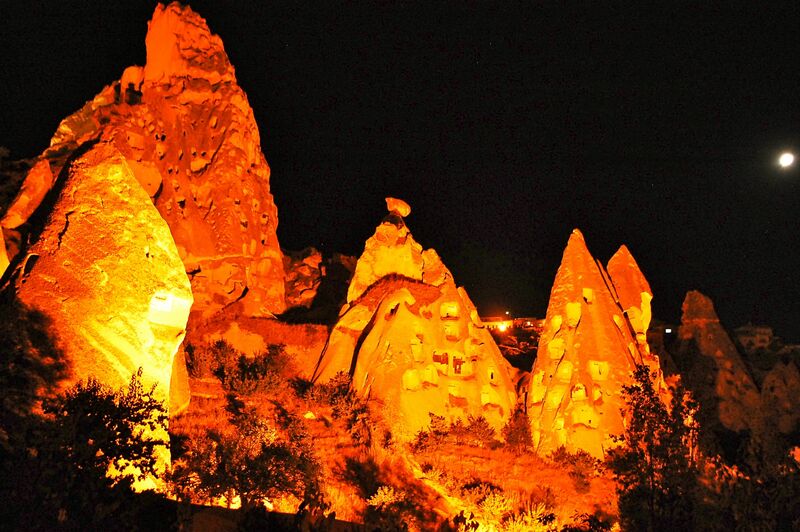 There are no roosters in Cappadocia, so we sleep a little bit longer. In the morning, I look out from my window, and the sky is full of big balloons – it’s like some big tourist thing in Cappadocia. We went sightseeing. 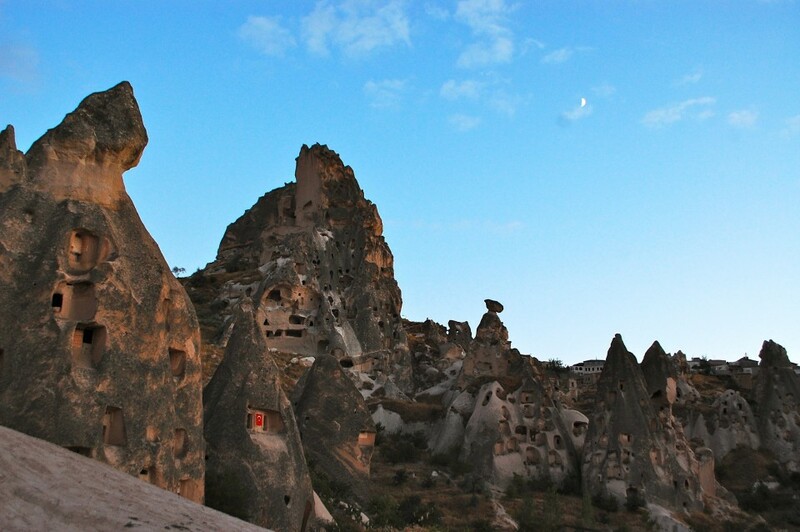 We climbed on deserted houses-caverns and wandered around the valley, which is made entirely of eroded something’s. We were fooling around in our sponsor T-shirts taking photos, when suddenly we heard woman’s voice Hey, where are you from? I was so happy that I understood Turkish, but Silvija spoke Croatian. Ok, first Croatian I/we meet on this trip. She told us she had same experience as we did – hospitality and kindness of local people, invitations to eat something and drink some tea. Her friend Dijana told her about some guy named Tomislav, who is travelling the world hitchhiking and couchsurfing…I wonder who might that be? After we’ve exchanged our cell phone numbers, we go our own separate ways. In less than 5 minutes we hitchhiked, no more, no less – than a horse carriage. We didn’t even have to stick our thumbs, it just stopped. 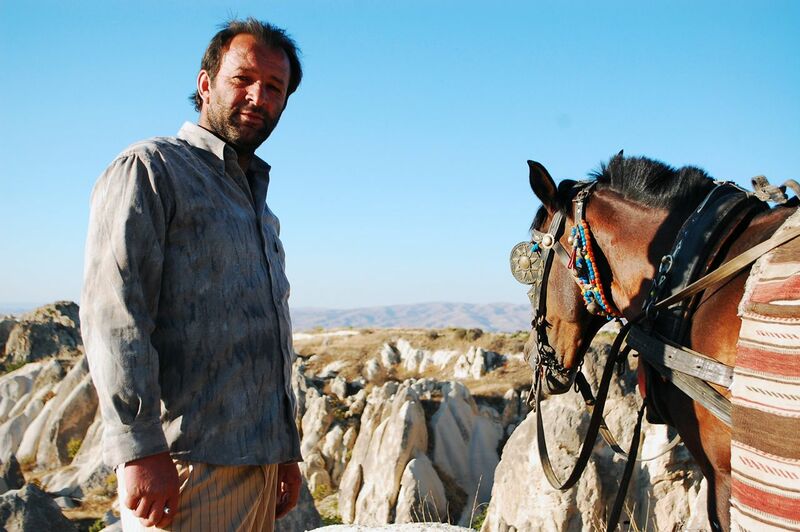 We humped on and Hasan, a strong Turkish driver, offers us sightseeing and we continued with him. It turned out that what should be a ride of a few kilometers (we just needed, lazy asses, ride uphill to the nearby lookout), became a private tour around valleys that lasted 3-4 hours. Along the way we met a couple from New Zealand. They gave me their contact, so when I get to New Zealand I should call them. I’m laughing inside, thinking – I don’t have a clue what I will do tomorrow, but I’m taking contacts from people so I can visit them in one year from now. Since life is full of surprises, who knows, maybe I’ll visit them someday. It’s funny that sometimes in your own home town, you never see some people again, and others you meet in different parts of the world. Hasan offers Tanja to try horseback riding, by herself, without carriage. The thought of riding a horse, without the saddle, made Tanja’s eyes sparkle. Ah, that cowgirl in her. She climbed the horse like a little girl, catching Hasan for his shoulders politely – which he didn’t really appreciate. And off they rode. Into the sunset. So I stood there, watching the carriage for about 15 seconds…and then I started to make pictures in my head about Tanja’s mom chasing me on the horse around Turkey, or even the entire globe, because I didn’t take good care of her daughter. I’m turning on my primitive Indian instincts, so I bend down, feeling the ground if it’s still warm, looking for horse trace and running as fast as I could, in their direction. Or the horse is some old nag or I’m a hell of a good runner, because I’m catching up with them after only 5 minutes. I’m relieved, and Tanja seems pretty happy to see me too. She says that everything was fine, until Hasan started to talk about watching the sunset with her. Sorry old guy, but no-no. Tanja is getting off the horse, we are thanking Hasan for the nice day we spent with him, and give him a fake promise that we’ll meet him tomorrow again. 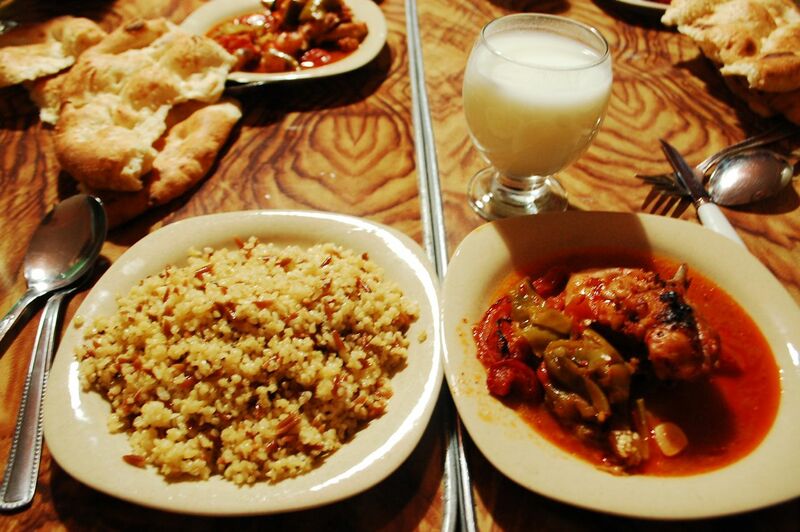 He promises us the feast – Turkish wine, barbecue and accommodation in his brother’s hotel. We meet up with our Croatian girl Silvija, and talk about our latest anecdotes and it looks like things like that never happen at home. Or maybe we should only go to visit our grandma who has horses and lives in village. We are hitchhiking our way back (we waited for an entire minute) to our host and then with playing guitars and singing, we pay our little room. We are welcomed by entire Kurdish/Turkish family. Mother, the head of the family, brothers, youngsters…everybody’s hugging us and kissing warmly, serving us with tea, again. Everybody gathered in family room ready for our concert. While they are recording us with their mobile phones, we play few songs in some kind of trash rock star manner. Husband from one of the sisters, proud and cheerful Kurdish guy, speaks some English, and we are trying to explain to him that we travel without any plan and schedule. He calls his friend and gives me his mobile. His friend speaks fluent English, so he translates our host’s invitation to stay over night. What did I tell you? Maybe I don’t speak Turkish, but my instincts are rarely wrong. We accept their proposition and join the family at dinner table. Later on, they take us around to meet their friends and acquaintances and everybody is looking at us with their warm and curious eyes. We feel like we are home, although most of our communication was reduced to body language. And that was enough. Everybody is so cheerful, no raising voices, no fighting…they even made jokes about Kurdish/Turkish tense relations. The little baby we were playing with was named a half-terrorist, because her father is Kurdish, and mother is Turkish. It really looks like a perfect coexistence. They give us a second dinner and then they send us off to the coziest couch ever, although we didn’t get our good night kiss. But that’s it – old school couchsurfing! Hospitality of our hosts continued the next morning with breakfast and they also washed and dried our clothes. If Tanja had more time, we’d stay a little bit longer. This way, we became a bit nervous and our feet began to itch. Our hosts wanted to take care of everything, but we convinced them they don’t need to, we’ll manage by ourselves. And it was just like when you visit relatives – at least stay for lunch. So we stayed for lunch. Well it is easier to hitchhike with a full stomach. Finally, we’re on the road again. We agreed, since the night is falling soon and we have to travel more than 400 kilometers to our next stop, to pull over only fast cars. After one slow car, just to warm up (we were driving only for 20km), we noted a big white car coming our way so we stuck out our thumbs. With the screeching of braking tyres, the car stopped. Two bold-headed, suspicious looking guys are telling us to hop in. We glanced at each other, thinking – we wanted fast cars, right? So we got in. It turns out we were full of prejudices – one of them recited names of all towns we were passing by, in so many details, he almost told us their history and dynasties. Who knows, maybe he did, but like I would remember it. Average speed was 190km/h, so soon we are back on the road with our thumbs up, to catch a ride for the last 200km we have left. At that point it wasn’t so important to catch a fast car. It was more important that we pull over somebody who goes directly to Diyabakir, so we wouldn’t have to be on the road somewhere half way, trying to hitchhike in the night time. As it usually happens, after 3 minutes, we pulled over an older man going all the way to Diyabakir. 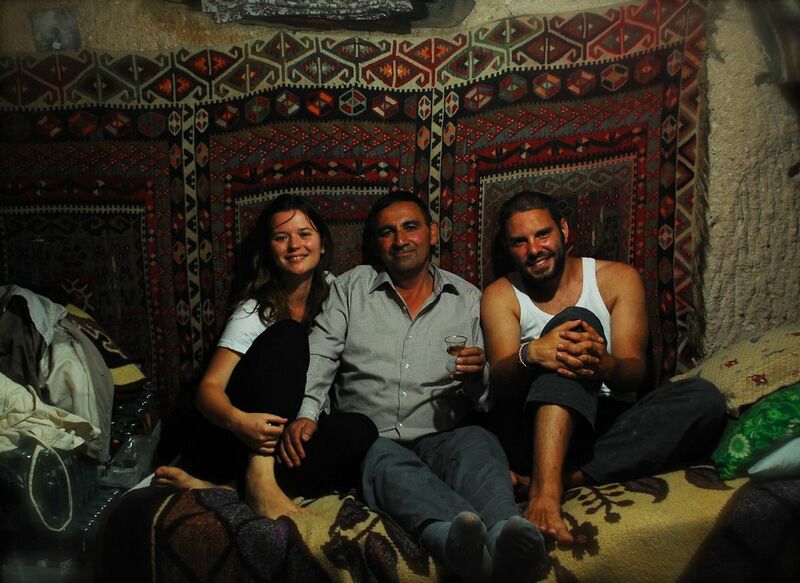 He’s asking us about our trip, hitchhiking…I tell him everything is going great, especially in the east part of Turkey. He’s correcting me immediately, telling me that’s Kurdistan, not Turkey. Right, old man. It’s Kurdistan then. So he leaves us in Diyabakir, where we finally meet our host, Hasan, a man who, with the moustache, long white hair and in his 60’s irresistibly reminds us of Albert Einstein. Albert probably never owned a rock bar downtown, but that’s just a detail. We’re drinking tea with him (can somebody please google if drinking that much tea has side effects, just to be safe? ), then he takes us home where we drink home made Raki, which everybody mixes with water, and it tastes like this Croatian candy, because of the anise. Or maybe these candies taste like Raki? Hasan tells me how he likes to give massages, so I tell him how I gave massages to my aunts since I was nine years old, and that was technically my first job. He gets up and brings some special massage oil. Me and my big mouth. So I got busy massaging his back, while Tanja is laughing at me and at the same time searching for our future hosts in our other destinations. And I’m laughing at her funny requests she’s sending to people. In the morning we decide that we should go directly to Iran or through the north part of Iraq, it all depends on our rides. I’m watching Hasan get ready for work, and I’m noticing that he’s straining a little around his neck. Well, he wanted a massage. Or maybe it was the wrong massage oil? Instead of taking a bus to get out of the town, just for the sake of it we pull over the first car coming behind the building. He dropped us off on the bus station, which is only 50 meters from the ‘highway’ towards Mardin. So, after few steps we were by the road again with our thumbs up. After several taxies pulled over, and we refused a ride, a white van stops. It doesn’t have any ‘taxi’ sign on it, but just to be safe, I ask the driver if that’s a taxi or not. He nods for yes. I thank him, explaining that we don’t have any money (in Turkish: para yok) he started to laugh out loud and says no problem. They are not bad, those taxi drivers. Who knows, maybe taxi drivers in Zagreb want to give free rides as well. Somebody please test them, and let me know. In the van we meet a couple – a girl from Armenia, and a guy from Iraq. 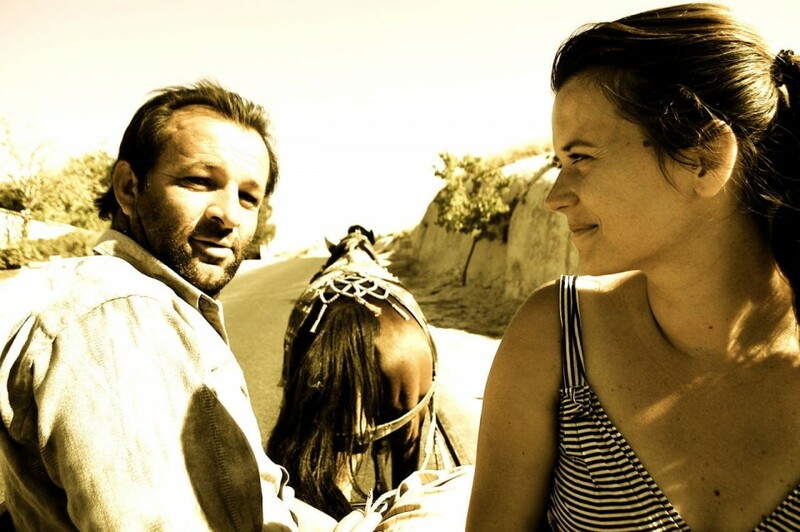 They live together for 12 years in Germany, so Tanja is using her polyglot abilities and finds out that they are going straight to Duhok, a little town in Iraq, that was also our potential destination! So they had rented that taxi-van to drive them 300km from Diyabakir to Iraq. What a coincidence, of all the people we came across them. And they will take us all the way, for free.